The Alpinestars Radon is a touring boot that takes keeping you dry seriously. The Drystar membrane is between the upper and the lining to prevent water intrusion. Three VELCRO® brand fasterner straps adjust to a variety of leg and ankle dimensions, so the Radon fits you. $10 Promotional Gift Card available on this product! Alpinestars boots are very consistent from one model to the next and in trying on this style, we find it to be consistent with their published sizing chart and most previous Alpinestars boots. If you know your best size from previous Alpinestars boots, then I’d advise you to choose the same size, or just use the chart to select a size based on a US street shoe size. I’d consider the width of the men’s sizes to be normal to slightly wide (D or E). 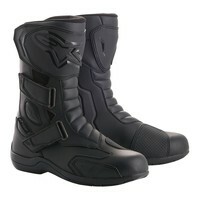 The Alpinestars Radon boot is a new style that is a hybrid of a few other styles. The Radon is a “standard” height boot so it is very similar in that regard to the Roam 2 and Web Gore Tex boots. I’ve compared this boot to the Roam 2 and it is VERY similar, but with a few features that adds just a bit more sport flavor. Like the Roam 2, this one closes with three Velcro buckles on the side. But the Radon has an added molded protective piece on the top-most strap that goes over the shin. That protective piece is very similar to what you see in either adventure or sport/racing boots like the SMX line of boots. Also, I see the addition of a protective pad on the side of the toe (where the Roam 2 had double leather). The summary above goes over all the standard features… those you’d expect to find in a street boot like this: protection built into the shin, heel, toe and ankle bone areas, a shifter pad to cut wear on the boot’s toe from rubbing the shifter, a sturdy molded sole, secure closure to keep the boots on your feet, waterproof/breathable liner.